Next Saturday will see the first substantial cycling event of the year in Taiwan. 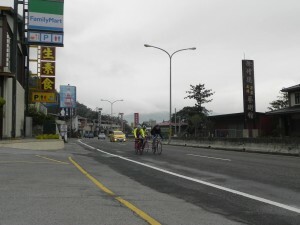 Cyclists will start from Puli in Central Taiwan and head down towards the coast for 30 km to Cao Tun. 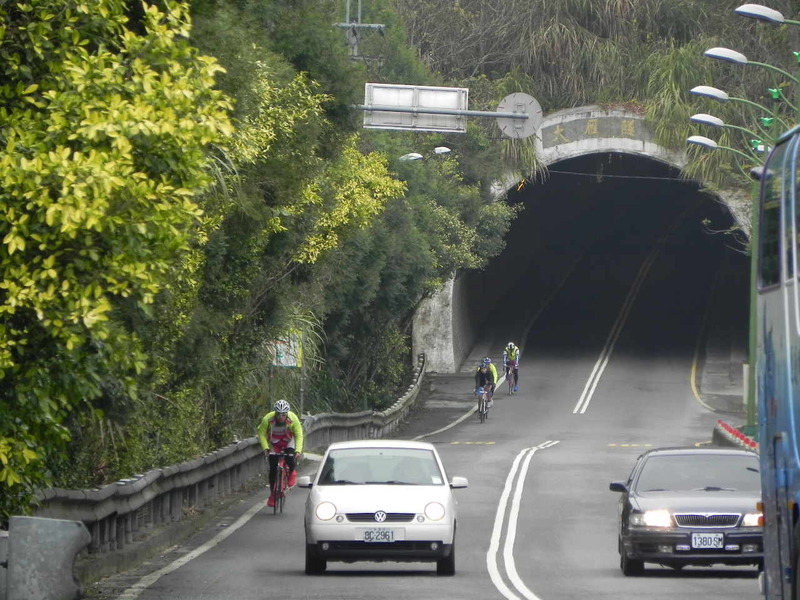 Then they will retrace their steps back to Puli for a right turn and 15km of moderate climbing to the finish at Sun Moon Lake. 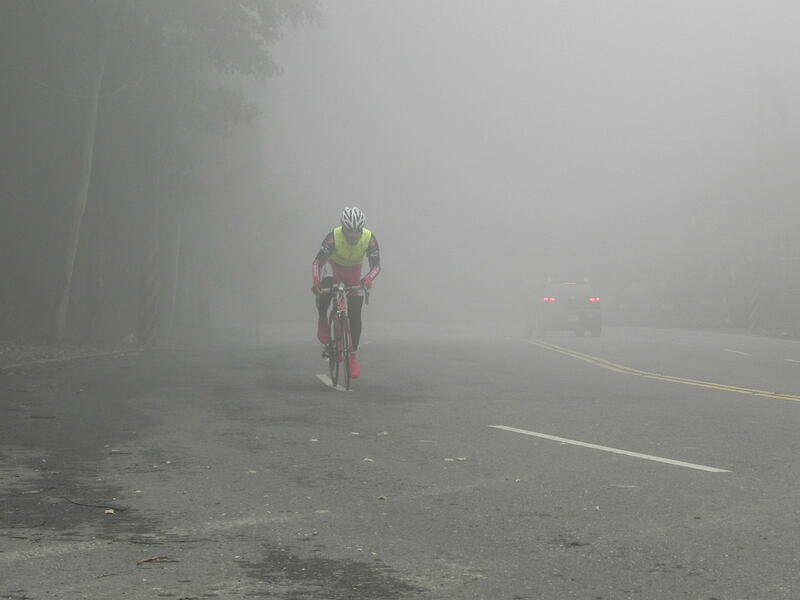 75km in total. This past Sunday was the opportunity for many cyclists to do a practice run over the hardest part of the course. This is the return ride of some 45km from Cao Tun up into the lake at an elevation of around 750m. I took the opportunity to do some photo shooting of a number of strong riders. Three of my own cycling team members joined them for the day’s training. The first part of the day’s ride involved a non-stop fast ride up to the lake. The return was made via descending an alternative route. It was an 8am meetup just out of Cao Tun’s main town-center. 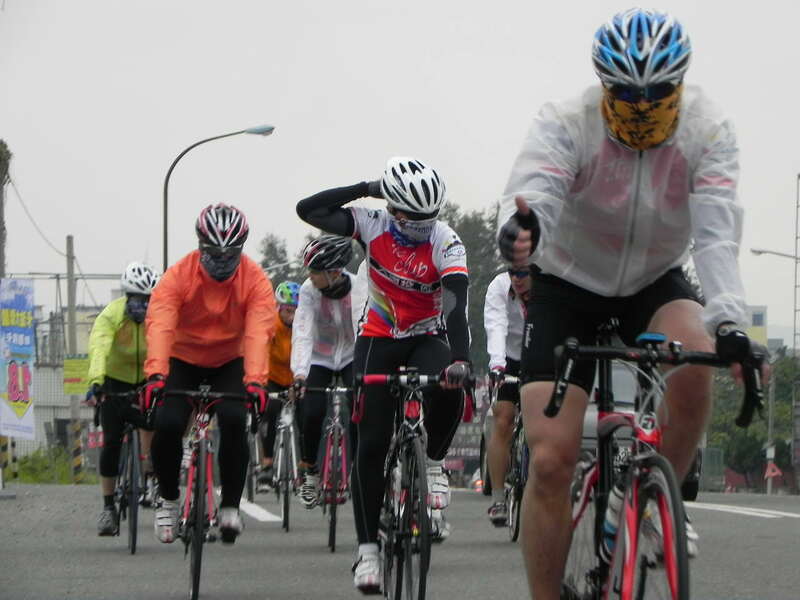 The strongest cyclist is Simon, on the far left. He’ll be in the M40 category and is likely to win that outright on Saturday. There were several other large groups that aimed to do the same ride. 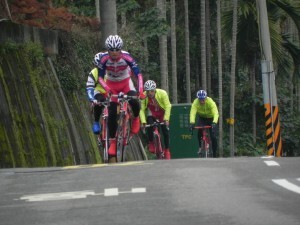 Very early the group I was following broke away and set the pace for the climb to Sun Moon Lake. 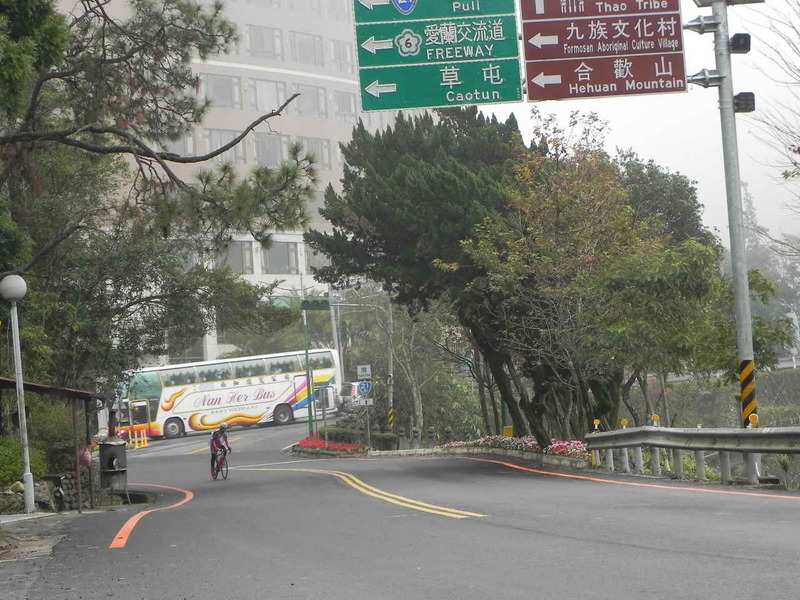 It’s around 3-4% average gradient the whole way. There’s a few small hills interspersed with short descents along the way within an overall ascending profile. 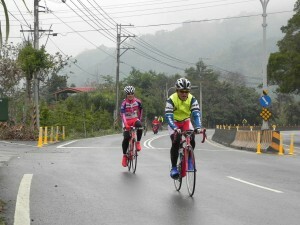 Simon (right) and Wei-Zai soon escaped the group as the rain started to fall. The day was overcast with a strong north wind. Rain was not forecast but it still rained over a 20km stretch of the road. 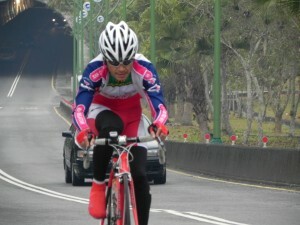 The day was actually pretty cold by Taiwan standards, around 12-13°. 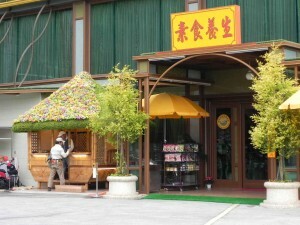 My team members were able to stay in touch with the group. Except for the youngster, You-Zheng. 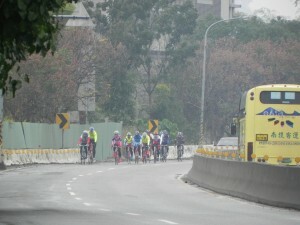 The breakaway group started with an all-out 1km sprint. 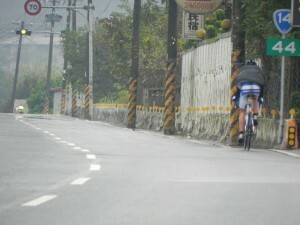 This caught You-Zheng napping and it took him until 10km from the lake to get back in touch with the leaders. This is one of the small rises on the way up. 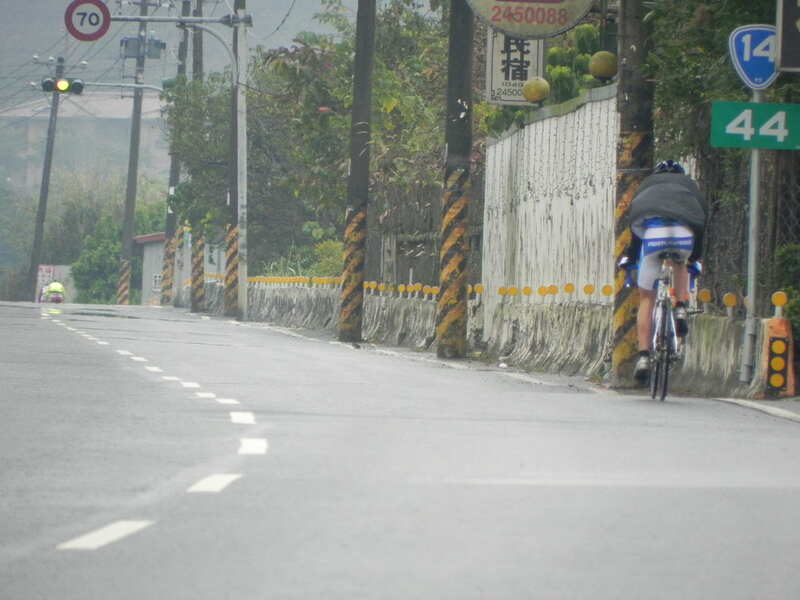 After the right turn at Puli with 12km to go, one of these riders, Danny, had been dropped and You-Zheng caught up. 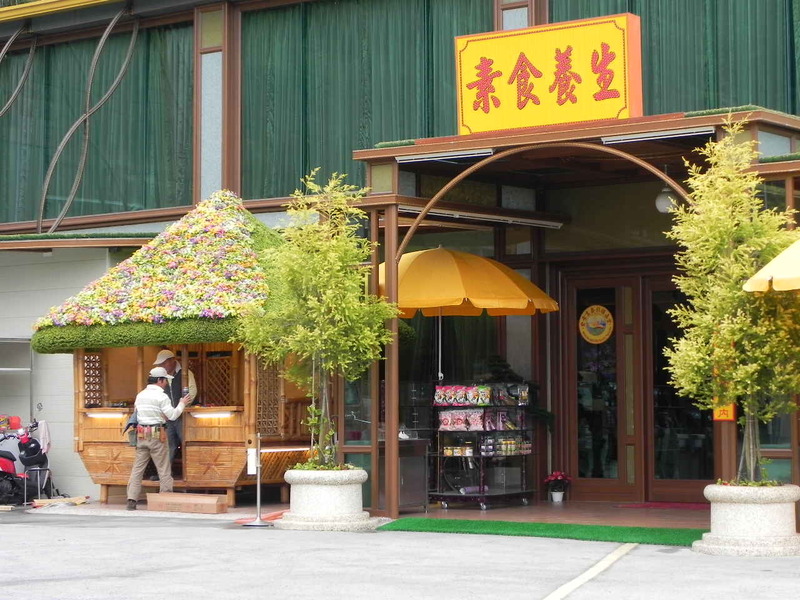 Warm, inviting places to eat. Focus, guys! There’s one tunnel around 8km from the lake. Simon came blasting out of this as he moved into overdrive. The others were not far behind. Danny begins to drop off the pace at the back. Ahead at the lake, Simon is the first in. The finish will be somewhere around here next week. No blue skies and picturesque boats out today. 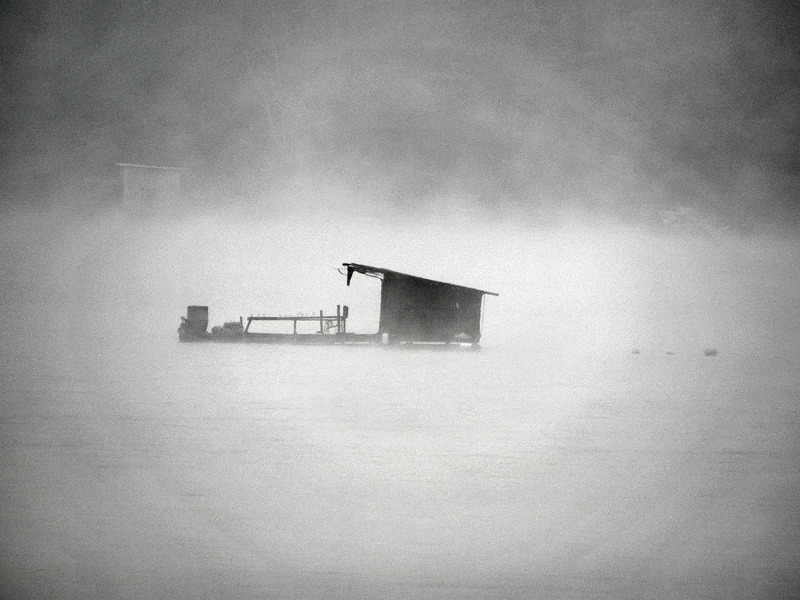 Just a ghostly shack keeping itself to itself. 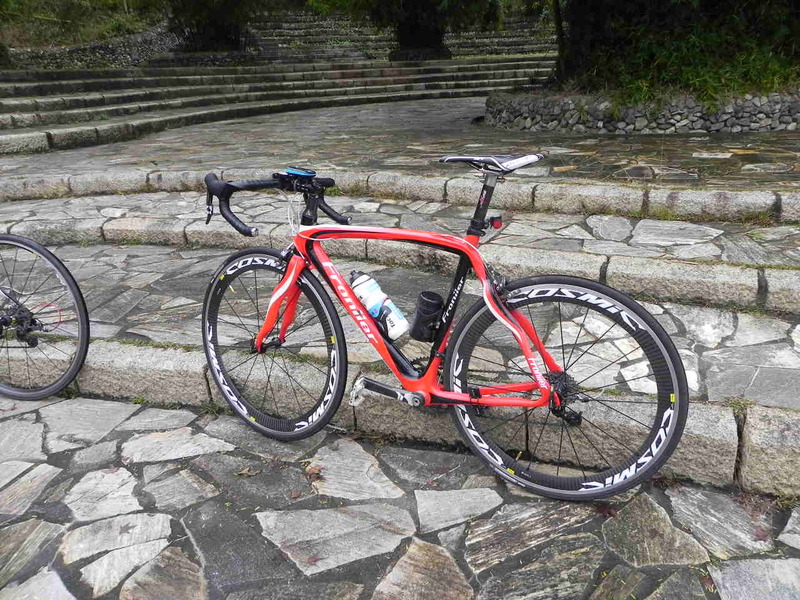 A rider from one of the three groups that set out from Cao Tun came in on this — looks a lot like Pinarello’s premier model. But it’s got a different label?? Having waited for the slower members of the group, everyone set off for the tricky descent off the lake, back to the lowlands. 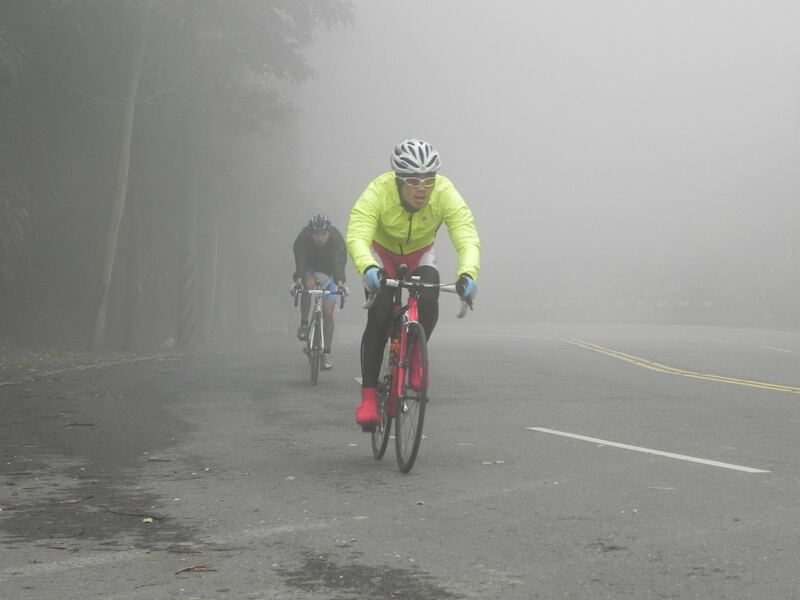 Still, the pace was brisk and one by one riders dropped off. The mist closed in as the leading group climbed the ridge leading to the main descent. Once again Simon is setting the pace. Wei-Zai and You-Zheng are hot on Simon’s wheel. The descent was fast despite low visibility. 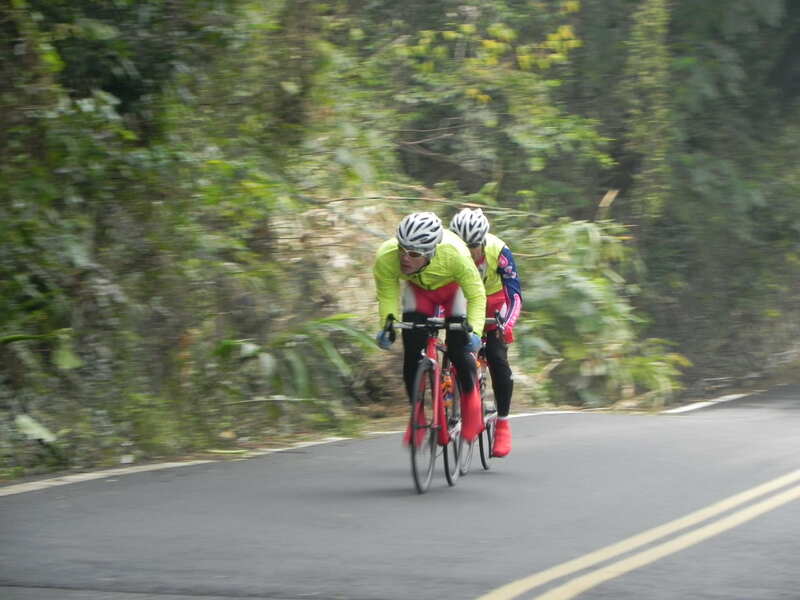 In the end Simon and Wei-Zai got a break on the others again and set a cracking pace for home from Shuili at the base of the descent. That is, until a flat tire brought things to a halt. Looking forward to next week’s racing. I’ll be out on the course trying to get some good shots. The weather is looking good with a forecast top of 22°. It should be good. Love reading your blog. 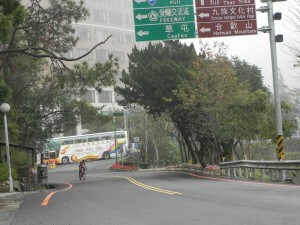 Especially a lot of nice photos of different routes in the mountains. Another guy and me is going to the Cycle Show in March, and will combine it with two weeks of training. 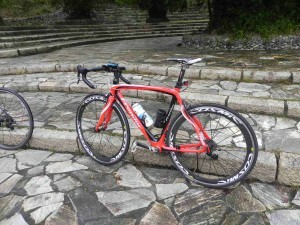 The Pinarello “look-a-like” is produced in Shenzhen. They ever produce fake Pinarello bikes there. Looks almost identical. Thanks for your reading the blog Emil. 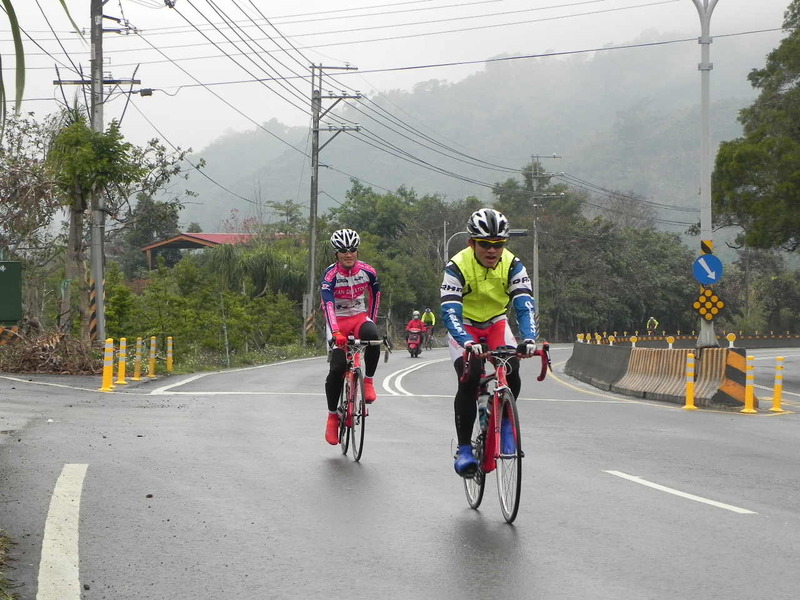 If you do some riding around Taichung you are welcome to ride with our team members. They can get you onto the routes covered on the blog. Good luck NCC next stage!